Some of today’s leading voices in technology, energy and health care will address the challenges faced by their industries and what the future holds at the 2015 Leadership and Innovation Summit Friday, Sept. 25, at Baylor University. The summit is the capstone of a day-long celebration of the dedication of Baylor’s new $100 million Paul L. Foster Campus for Business and Innovation. The 2015 Leadership and Innovation Summit will feature three Q&A forums with key industry leaders and executives in the areas of technology, energy and health care. The celebration will be capped off with an innovation forum featuring a conversation between Baylor President and Chancellor Ken Starr and Jeffrey Immelt, chairman and CEO of General Electric. Note: A mult box will be provided. A microphone check will be conducted at 10:30 a.m. Due to scheduling, none will be accommodated after that point. Media note: All events, except the dedication ceremony, are invite-only. All panel discussions will be streamed live at https://www.baylor.edu/fostercampus. The conversation between Judge Starr and Jeffrey Immelt will not be streamed. Media is invited to attend the dedication ceremony and panel discussions. Please submit your name and media outlet for credentials to Eric_M_Eckert@baylor.edu. Deadline for credentials is Wednesday, Sept. 23, 2015. If you are unable to attend, the forums will be streamed live at www.baylor.edu/fostercampus. Credentialed media will receive a parking pass via email. Media parking will be on the top three floors of the Speight Parking Garage, 1521 S. 4th Street. Parking passes will be needed for the event. 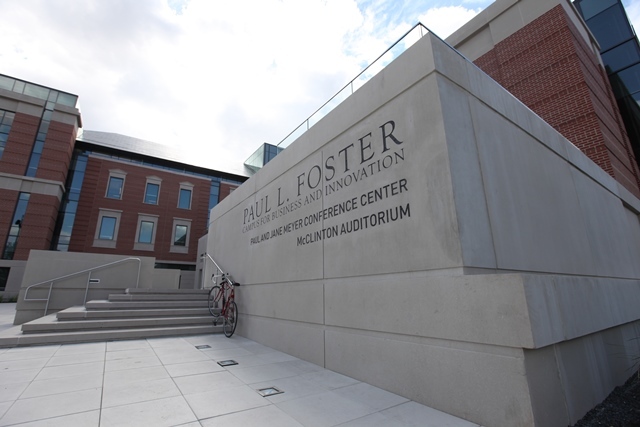 • When arriving at the Paul L. Foster Campus for Business and Innovation, the media entrance is located at the southwest corner of the building, the entrance closest to the designated parking garage. To accommodate you and your equipment, this entrance is NOT the same entrance that will be used by dedication and summit attendees. • Media will have a designated room (Foster 121) for check-in and storing of equipment. This room will also be open throughout the day for you to use. • Wi-fi will be available and will be assigned, per person, per device, at check-in. If you have a data plan, please feel free to use that system instead. • A mult box will be provided during the dedication ceremony and the panel discussions. Note: A microphone check will take place at 10:30 a.m. for the dedication ceremony. Due to scheduling, none will be accommodated after that point. • A designated media area will be provided for the dedication ceremony and the panel discussions. Note: We ask that cameras and operators please stay in these designated areas. We anticipate that space will be tight. • Panelists for the forums on energy, technology and health care will be available briefly for interviews following their respective forums. Following a remarkably successful fundraising campaign - including an historic $35 million gift from El Paso businessman and Baylor graduate Paul L. Foster, B.B.A. '79, and major gifts from more than 500 additional donors - construction on the Foster Campus began in December 2013 on property along Bagby Avenue between Third and Fourth Streets. Faculty and staff moved into the building over the summer, and students began classes in the Foster Campus on Aug. 24. "That day was an important milestone in the life of the Hankamer School of Business as our students began to experience all that our new home, the Paul L. Foster Campus for Business and Innovation, has to offer," said Terry Maness. D.B.A., dean of the Hankamer School of Business. "It was exciting for me to see the students begin to explore all the new features of the Foster Campus, from social collaboration spaces to student team meeting rooms to enhanced technology and a variety of different kinds of learning spaces. The Foster Campus will significantly enrich the learning experiences for our students." The Foster Campus expands the size of the business school by 40 percent and increases opportunities for student and faculty collaboration across areas of business, science and technology. The building's architectural design features a highly corporate and sustainable business environment, including the centerpiece Hankamer Atrium that showcases some of the school's signature classrooms, such as the Financial Markets Center. A variety of classroom learning spaces incorporate the latest classroom technology while providing flexibility to adapt as technology advances. The 350-seat McClinton Auditorium can accommodate a wide range of guest lectures and events, and the adjacent Meyer Conference Center will host seminars, symposia and conferences for business professionals of all kinds. 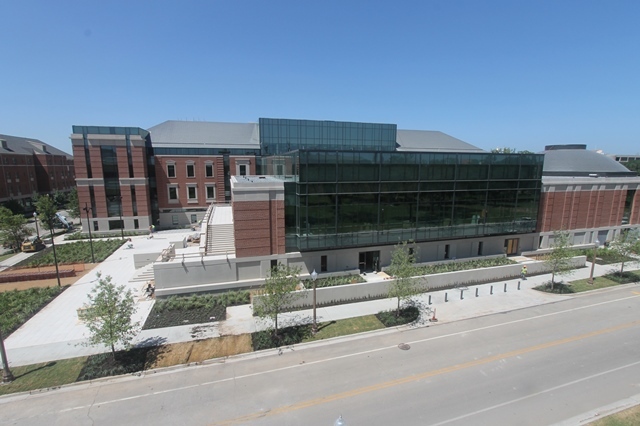 Baylor University's Hankamer School of Business, housed in the Paul L. Foster Campus for Business and Innovation, provides a rigorous academic experience, consisting of classroom and hands-on learning, guided by Christian commitment and a global perspective. Recognized nationally for several programs, including Entrepreneurship and Accounting, the school offers 24 undergraduate and 13 graduate areas of study. Visit www.baylor.edu/business and follow on Twitter at twitter.com/Baylor_Business.